At A1 Web Server, we’ve been making money online since 1998. One lesson we’ve learned well is that an un-promoted website is generally an unsuccessful and unprofitable website. If you’re serious about succeeding online, we have the experience to help you succeed. There are three secrets to getting lots of traffic from the search engines – great keywords selection, links from other websites to your site, and search engine optimized websites. It all starts with the keywords. If you fail here, you’ve failed completely. Succeed, however, and you’re well on your way. It’s important to select keywords which are actually used by searchers. The words which you think people are using to search for you are most likely not the words and phrases they actually use. We can help here. 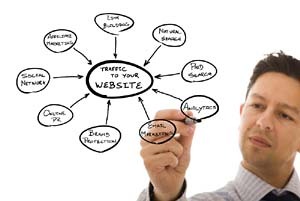 A site analysis with keywords suggestion is extremely affordable. We scientifically analyze each possible keyword until we come up with a list which promises you the greatest likelihood of success. Links to your site are a big deal. You benefit twice when someone links to you. You stand to get visitors from someone clicking on the link, and you will probably rank higher in the search engines because multiple links in indicate that your site is important and useful. The first place to begin your link building is with the important web and local directories and niche directories. We’d be happy to get you started with this. It’s important that you optimize your webpages to rank highly in the search engines. Search engine optimization is something you should do for each page in your site. Ideally, you’ll optimize each page to rank well for one or two of the keywords you are targeting.